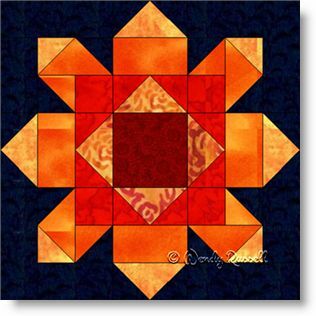 The quilt block name of Firewheel suggested an image of a great burst of fire in the night sky. So accordingly, I chose colours to reflect that in my version of this quilt block. This eight patch block is comprised of a variety of familiar shapes in quiltmaking -- squares, rectangles, half square triangles and flying geese patches. There is nothing difficult to sew, but care must be taken to achieve an accurate quarter inch seam allowance, due to the number of pieces in the block. The sample quilts illustrated both use an on point setting of the quilt blocks, but offer up very different looking quilts. Simple placement and imagination are all the tools needed to make your own striking quilt.